It feels as if we’ve always cherished the ruins of our stately homes, great abbeys, castles and ancient monuments. Yet our love affair with historic buildings is relatively recent. It’s been a revolution that flew in the face of industrial change and has been inspired both by acts of personal bravado and government intervention. A new series on BBC Four this month called “Heritage! The Battle for Britain’s Past” looks at those pioneers of the past who fought to save the physical remains of the nation’s history. 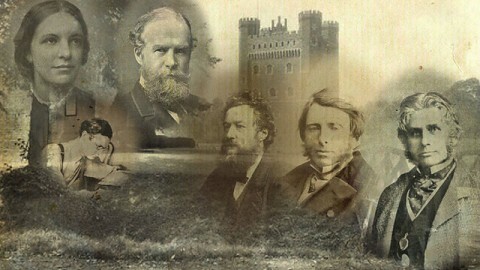 Some like William Morris, Octavia Hill and John Betjeman are familiar names, others – the “men from the ministry” /who worked quietly behind the scenes – are unsung heroes. The first episode charts the birth of the heritage movement and the battle to save Britain’s great sites from destruction. The second episode looks at the interwar years, the rise of the day out to a historic site, and the struggle for the future of the English country house. And the final episode examines how in the second half of the 20th century, the definition of what did and did not constitute “heritage” changed. Made in partnership with English Heritage, the series features contributions from many of EH’s experts and draws upon its research into the early acts of heritage legislation – including the landmark Ancient Monuments Act of 1913. A timely reminder to all of us about just how important these buildings remain, how we so nearly lost so many and the lessons we mustn’t forget. Had the question been posed at the dawn of time – which is the species most likely to survive and dominate the planet? – mankind would probably not even have featured. After all, we’re a somewhat puny lot. We don’t have claws or sharp teeth to help us hunt, or fur to keep us warm. We’re neither the tallest nor the fastest animals on Earth. Our babies are born pitifully weak. As species go, you’d have been crazy to have bet on us. Yet survive we have, while 99 per cent of all life forms have become extinct. How on Earth did we do it? My new TV series Mankind: The Story Of All Of Us on the History Channel sets out to answer this question. It tells the whole story of humankind in 12 hours. We wanted to take a completely new look at who we are and where we came from, and make it thrilling television at the same time. It’s a ridiculously huge undertaking, but with the world beset by economic crisis and threatened by climate change, we wanted to tell an optimistic story of the incredible things that we, as a species, have accomplished. We have, after all, manipulated the forces of our planet. We used fire to cook our food, making it easier to digest – giving us smaller stomachs and bigger brains (they’ve doubled in size in 2 million years). We turned other animals into companions – our Ice Age enemy, the wolf, became a hunting buddy and man’s best friend. These ancient wolves are the ancestors of all the dogs alive today. And we unravelled the chemistry of our planet, unlocking nitrogen from the atmosphere to use as fertiliser – revolutionising food production and helping our population to grow faster in the first 50 years of the 20th century than it did in the previous 50,000. Mankind’s journey from a few thousand hunter-gatherers on the African savannah 100,000 years ago to a population of seven billion today has been one built around science, invention and warfare. Along the way we have learned about the weather, navigation and trade, about medicine, evolution and the explosive power of the atom. The sacking of Rome, the industrial revolution and mapping our own DNA are just a handful of the pivotal points along the route. Today, one in three people on the planet is Christian, but word of the death of a man called Jesus from Nazareth 2,000 years ago might never have spread across the world if it hadn’t been for the might of the Roman Empire. It was the Romans who mastered road-building and built a vast network of shipping lanes, allowing goods and ideas to flow across three continents. In the Andes, the Spanish opened up the largest silver mine in the world in the 16th century, minting millions of coins which transformed the global economy – filling the chests of pirates, fuelling a stock market boom and, via the British Empire, helping to pay for the Taj Mahal. As trade boomed, millions of people came into the New World as slaves, bringing their customs and culture with them and creating a diaspora that has spread around the planet. The tale we’re telling is a global story. What most of us learn at school is our own history: I learned British history, but now I live in America with my British husband and very American seven-year-old daughter, Molly. She gets taught American history and knows everything about George Washington, but not so much about Brunel. It’s the same story across the world: in Shanghai you learn Chinese history, in Lima, Peruvian history. None of us grows up thinking about how astoundingly interconnected the whole world is. How many of us realise that ancient Britons built Stonehenge around the same time as the Egyptians constructed the pyramids, over 2,000 miles away? Or that farming was discovered – across the world – at almost exactly the same time? How different would the world be if every child, everywhere, grew up thinking about all the things that have united mankind for millions of years, rather than the things that divide us right now? People ask me how you go about condensing so much information into 12 hours of television, and the answer is prodigious planning, then breaking it down into manageable nuggets. We decided where we wanted to start (the Big Bang) and end (the near future). Then our team spoke to an awful lot of people. Our main consultant was Ian Morris, the British professor of History and Classics at America’s Stanford University, but we also spoke to a further 200 or so historians across the globe. When we made the series The British for Sky TV earlier this year we had experts who knew our entire history. With Mankind we had to find the one person who knew about the Vikings in America, for example, then someone else who knew about corn in the Mayan diet, and so on. Most importantly we wanted to create must-see television. I want there to be a buzz and for people to want to be at home for it. To realise that feeling of excitement we’ve tried not only to tell incredible tales from the past, but to show them in a totally different way. We spent two years filming in four different countries to give the shows a variety of landscapes that would make them visually astounding. We’ve tried to give people a feature-film experience. I want the audience to feel as though the history is growing around them – which we’ve attempted to do with computer graphics to complement the drama. The final piece of the jigsaw was securing Stephen Fry for the voice-over. His excitement about knowledge is a joy to behold and very close to the heart of what we’re trying to do. I hope everyone watching will discover something new. For me, it all comes down to one big thing. The world we live in has to contend with ferocious storms and economic meltdowns, but in the mid-14th century plague wiped out a third of the population of Europe in a couple of years. Mankind survived, and a new world emerged. We are incredibly resilient and we go on and on. If you take the really long view, things always get better. This face is 2000 years old. He is a mature man with hair combed back, clean-shaven except for a well-groomed moustache. Images of prehistoric Britons are very rare and in the Iron Age people were almost never shown as statues or carved as part of the decoration on objects. La Tène art styles were usually abstract and rarely showed images of people, animals or plants. This pattern changed at the very end of the Iron Age in the south east of the England. Here, there are a few pictures of Iron Age men shown on coins or as decorations on wooden buckets. 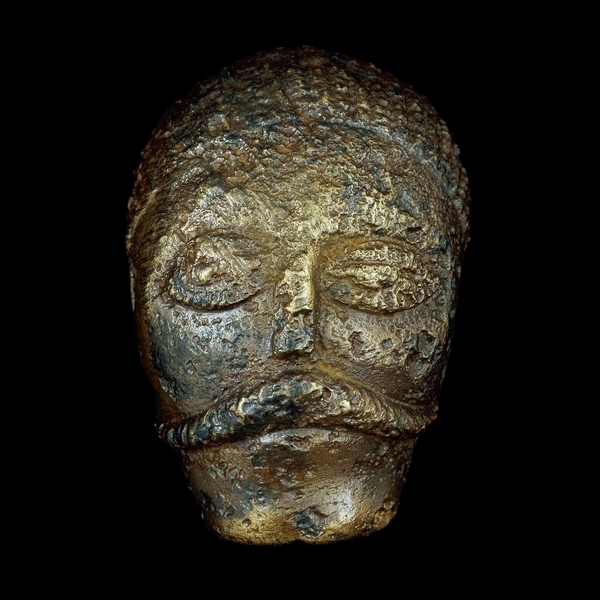 This is one of three small bronze models of men’s faces that were the decoration on a wooden bucket found in a Late Iron Age cremation burial. The grave probably belonged to someone of great importance and wealth, perhaps even a king or queen. The bucket would have looked similar to the one found in another Late Iron Age cremation burial at Aylesford, Kent. This also had men’s faces on the handle mounts. The grave was the burial of a king or queen similar to another royal grave at Welwyn Garden City. The grave also contained two bronze jugs and a bronze pan, similar to examples from the Aylesford burial. There were also two Roman silver cups, five Roman wine amphorae and many pots. A “nationally significant” hoard of Roman gold coins has been found by a metal detectorist in Hertfordshire. 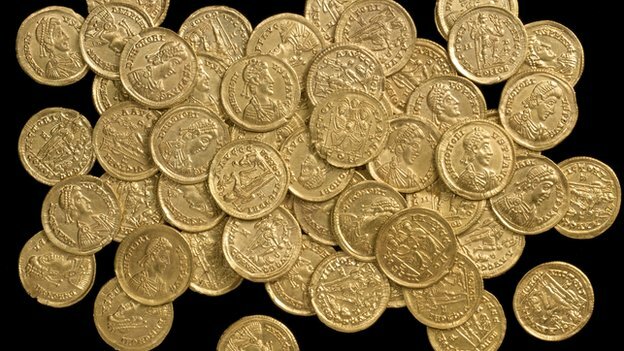 The stash – found on private land north of St Albans – is believed to be one of the largest Roman gold coin hoards discovered in the UK. The 159 coins date to the end of the 4th Century during the final years of Roman rule in Britain. After AD 408 no more coin supplies reached the country. The value of the hoard has not yet been assessed. A team from St Albans City and District Council museums’ service investigated the site at the beginning of October to confirm the find. The council said the coins were scattered across a fairly wide area and that there were “practically no other comparable gold hoards of this period”. 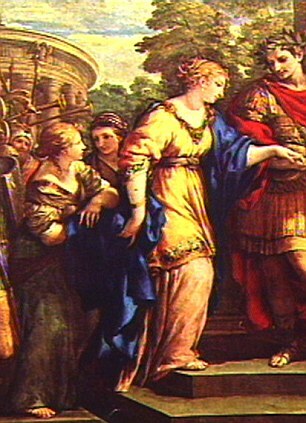 They were mostly struck in the Italian cities of Milan and Ravenna and issued under the Emperors Gratian, Valentinian, Theodosius, Arcadius and Honorius. Councillor Mike Wakely called it “an exciting find of national significance” and said the coins would go on display at Verulamium Museum. David Thorold, from the museum, said that during Roman occupation, coins were usually buried either as a religious sacrifice to the Gods, or as a secure store of wealth to recover later. “Threat of war or raids might lead to burial in the latter case, as may the prospect of a long journey, or any other risky activity,” he said. The curator added that gold coins were “extremely valuable” and not exchanged on a regular basis. “They would have been used for large transactions such as buying land or goods by the shipload,” he said. The 1996 Treasure Act legally obliges finders of historic metal objects to report their discovery to the local coroner who determines whether or not it constitutes treasure. Drive west from Orkney’s capital, Kirkwall, and then head north on the narrow B9055 and you will reach a single stone monolith that guards the entrance to a spit of land known as the Ness of Brodgar. The promontory separates the island’s two largest bodies of freshwater, the Loch of Stenness and the Loch of Harray. At their furthest edges, the lochs’ peaty brown water laps against fields and hills that form a natural amphitheatre; a landscape peppered with giant rings of stone, chambered cairns, ancient villages and other archaeological riches. This is the heartland of the Neolithic North, a bleak, mysterious place that has made Orkney a magnet for archaeologists, historians and other researchers. For decades they have tramped the island measuring and ex- cavating its great Stone Age sites. The land was surveyed, mapped and known until a recent chance discovery revealed that for all their attention, scientists had completely overlooked a Neolithic treasure that utterly eclipses all others on Orkney – and in the rest of Europe. Once protected by two giant walls, each more than 100m long and 4m high, the complex at Ness contained more than a dozen large temples – one measured almost 25m square – that were linked to outhouses and kitchens by carefully constructed stone pavements. The bones of sacrificed cattle, elegantly made pottery and pieces of painted ceramics lie scattered round the site. The exact purpose of the complex is a mystery, though it is clearly ancient. Some parts were constructed more than 5,000 years ago. The people of the Neolithic – the new Stone Age – were the first farmers in Britain, and they arrived on Orkney about 6,000 years ago. They cultivated the land, built farmsteads and rapidly established a vibrant culture, erecting giant stone circles, chambered communal tombs – and a giant complex of buildings at the Ness of Brodgar. The religious beliefs that underpinned these vast works is unknown, however, as is the purpose of the Brodgar temples. What is clear is that the cultural energy of the few thousand farming folk of Orkney dwarfed those of other civilisations at that time. In size and sophistication, the Ness of Brodgar is comparable with Stonehenge or the wonders of ancient Egypt. Yet the temple complex predates them all. The fact that this great stately edifice was constructed on Orkney, an island that has become a byword for remoteness, makes the site’s discovery all the more remarkable. For many archaeologists, its discovery has revolutionised our understanding of ancient Britain. It is a view shared by local historian Tom Muir, of the Orkney Museum. “The whole text book of British archaeology for this period will have to be torn up and rewritten from scratch thanks to this place,” he says. Farmers first reached Orkney on boats that took them across the narrow – but treacherously dangerous – Pentland Firth from mainland Scotland. These were the people of the New Stone Age, and they brought cattle, pigs and sheep with them, as well as grain to plant and ploughs to till the land. The few hunter-gatherers already living on Orkney were replaced and farmsteads were established across the archipelago. 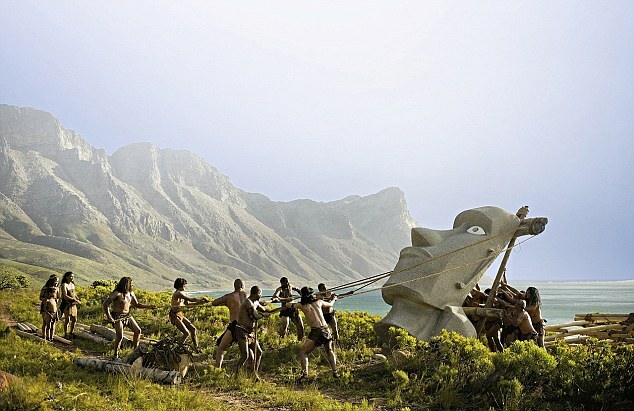 These early farmers were clearly successful, though life would still have been precarious, with hunting providing precious supplies of extra protein. At the village of Knap o’Howar on Papay the bones of domesticated cattle, sheep and pigs have been found alongside those of wild deer, whales and seals, for example, while analysis of human bones from the period suggest that few people reached the age of 50. Those who survived childhood usually died in their 30s. Discarded stone tools and shards of elegant pottery also indicate that the early Orcadians were developing an increasingly sophisticated society. Over the centuries, their small farming communities coalesced into larger tribal units, possibly with an elite ruling class, and they began to construct bigger and bigger monuments. These sites included the 5,000-year-old village of Skara Brae; the giant chambered grave of Maeshowe, a Stone Age mausoleum whose internal walls were later carved with runes by Vikings; and the Stones of Stenness and the Ring of Brodgar, two huge neighbouring circles of standing stones. These are some of the finest Neolithic monuments in the world, and in 1999 they were given World Heritage status by Unesco, an act that led directly to the discovery of the Ness of Brodgar. “Being given World Heritage status meant we had to think about the land surrounding the sites,” says Card. “We decided to carry out geophysical surveys to see what else might be found there.” Such surveys involve the use of magnetometers and ground-penetrating radar to pinpoint manmade artefacts hidden underground. And the first place selected by Card for this electromagnetic investigation was the Ness of Brodgar. The ridge was assumed to be natural. However, Card’s magnetometers showed that it was entirely manmade and bristled with features that included lines of walls, concentric pathways and outlines of large buildings. “The density of these features stunned us,” says Card. 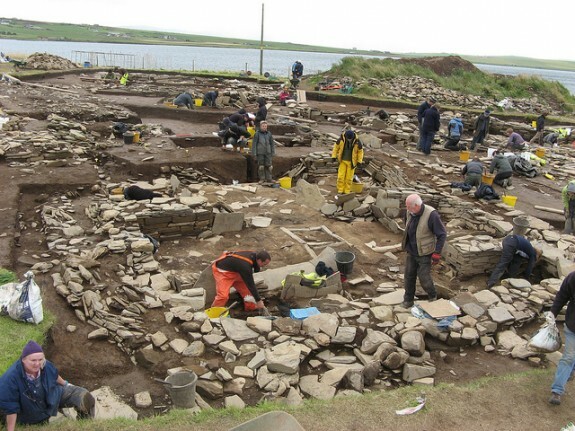 At first, given its size, the team assumed they had stumbled on a general site that had been in continuous use for some time, providing shelter for people for most of Orkney’s history, from prehistoric to medieval times. “No other interpretation seemed to fit the observations,” adds Card. But once more the Ness of Brodgar would confound expectations. Test pits, a metre square across, were drilled in lines across the ridge and revealed elaborate walls, slabs of carefully carved rock, and pieces of pottery. None came from the Bronze Age, however, nor from the Viking era or medieval times. Dozens of pits were dug over the ridge, an area the size of five football pitches, and every one revealed items with a Neolithic background. Then the digging began in earnest and quickly revealed the remains of buildings of startling sophistication. Carefully made pathways surrounded walls – some of them several metres high – that had been constructed with patience and precision. Slowly the shape and dimensions of the Ness of Brodgar site revealed themselves. Two great walls, several metres high, had been built straight across the ridge. There was no way you could pass along the Ness without going through the complex. Within those walls a series of temples had been built, many on top of older ones. “The place seems to have been in use for a thousand years, with building going on all the time,” says Card. More than a dozen of these temples have already been uncovered though only about 10% of the site has been fully excavated so far. The surrounding hills are relatively low, and a great dome of sky hangs over Brodgar, perfect for watching the setting and rising of the sun, moon and other celestial objects. 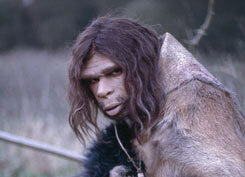 (Card believes the weather on Orkney may have been warmer and clearer 4,000 to 5,000 years ago.) 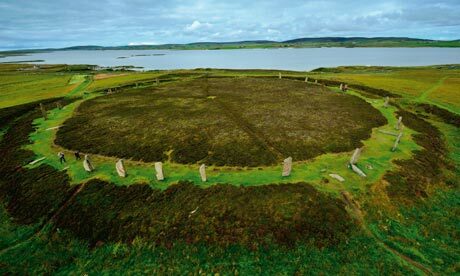 Cosmology would have been critical to society then, he argues, helping farmers predict the seasons – a point supported by scientists such as the late Alexander Thom, who believed that the Ring of Brodgar was an observatory designed for studying the movement of the moon. Equally puzzling was the fate of the complex. Around 2,300BC, roughly a thousand years after construction began there, the place was abruptly abandoned. Radiocarbon dating of animal bones suggests that a huge feast ceremony was held, with more than 600 cattle slaughtered, after which the site appears to have been decommissioned. Perhaps a transfer of power took place or a new religion replaced the old one. Whatever the reason, the great temple complex – on which Orcadians had lavished almost a millennium’s effort – was abandoned and forgotten for the next 4,000 years. A new find in the region surrounding the Ring of Brodgar, a stone-pillar construction mounted atop a sloping terrain, has overthrown the scientific conception of Stone Age life in the British Isles. Archeologists have uncovered a six-acre temple complex of painted stone and paved walkways, which was built five thousand years ago—before the pyramids of Egypt or even Stonehenge. [T]he complex at Ness contained more than a dozen large temples – one measured almost 25m square – that were linked to outhouses and kitchens by carefully constructed stone pavements. The bones of sacrificed cattle, elegantly made pottery and pieces of painted ceramics lie scattered round the site. The exact purpose of the complex is a mystery, though it is clearly ancient. Some parts were constructed more than 5,000 years ago. Orkney was the centre for innovation for the British isles. Ideas spread from this place. The first grooved pottery, which is so distinctive of the era, was made here, for example, and the first henges – stone rings with ditches round them – were erected on Orkney. 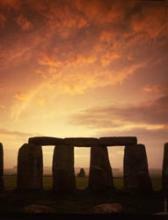 Then the ideas spread to the rest of the Neolithic Britain. This was the font for new thinking at the time.